Web-based Gmail is a pleasure to use, and many people use it exclusively. But your messages and contacts in Gmail can get lost or deleted accidentally. And there's always the possibility you could lose access to your account, for various reasons. Here are a couple of ways to make backup copies of your Gmail, easily and automatically. You may want a local backup of your Gmail, in case you ever want to read Gmail while you are offline. Local backups are easy, if you have a desktop email client such as Microsoft Outlook or Thunderbird. Log in to your Gmail account, click on the gear icon in the upper right corner, and select "Mail Settings". Now click the "Forwarding and POP/IMAP" tab. Now, fire up your desktop email client (Outlook, Thunderbird, etc.). Create a new email account using your Gmail address. Configure it to fetch new from Gmail's POP server. Google even provides detailed instructions for many email clients. Use your desktop client to check for new Gmail. It may take a long time to download everything. Spam and deleted Gmail will not be downloaded. Configure your desktop client to automatically check for new Gmail every so often, and you will always have a local backup copy of your Gmail! Gmail Backup is a freeware program that does a fine job of backing up Gmail. There's no graphical interface, but the command-line options are easy enough to understand. Gmail Backup does not require you to have a desktop email client, and creates a plain-text backup of your Gmail messages. Each message is stored as a separate file in a folder your specify. I like that because I can use a search utility or even a text editor to scan or view the contents. If you want your Gmail backed up "in the cloud," that's easy too. Create an email account on any other free Web-based email service (Yahoo Mail, Hotmail, etc.). This account will hold all of your Gmail. Log in to Gmail and click on "Create a filter" at the top of the page. In the "From" field, enter your Gmail address to select all messages that you have sent. Click "Test Search" and then "Next Step". Click "Forward it" and enter your newly created backup email address in the box. Check box next to "Also apply this filter to all XXXX conversations below". Click "Create Filter". Everything you have sent from your Gmail address will be forwarded to the backup email account. Repeat these steps using the "To" field instead of "From" to forward almost everything you have received at your email address (except spam and deleted mail). What about restoring Gmail from backups? You can't do that using either the POP or forwarding method. The Gmail Backup program has a restore option, but I have not tested it. But there is a paid service that can do both backup and restore for Gmail. Backupify.com is a cloud-based backup service that claims over 150,000 users. It can automatically backup Gmail, Google Apps domains, Twitter, Facebook, and other social media content. With one click, you can restore Gmail or Google Docs backups to their Google accounts. Pricing is $3/month per account for Google Apps (including Gmail). A 30-day free trial is offered. Most recent comments on "How Do I Backup My Gmail?" At least twice a year I make and save a copy of my outlook.pst file separate from the monthly Windows 7 backup. This is easy and fast. Further, it has saved me a couple of times when the PST file got corrupted. Another program you may want to look at is a freeware program called MailStore Home. Here is a link to their site: http://www.mailstore.com/en/mailstore-home.aspx . This program does everything you may want to store email on your local machine. This program will backup most local email clients like Mozilla Thunderbird or Outlook and any web based email service. I have used this program for years and never lost an email. A couple of years ago there was a new function which allowed one to use Gmail offline. It was a subsiduary of Google gears if I remember correctly, and was supposed to download all one's in-and-out mail automatically to a dedicated folder. I found it to be slow, cumbersome and unreliable, and soon dropped it. Do you know if it still exist Bob and, if so, if it has it been perfected? EDITOR'S NOTE: I've read that Gears is defunct, so the status of Gmail Offline seems murky to me. I have several domain names which I own, and all my email goes to (catchall) addresses at those domains. It is then email-forwarded to my Gmail account, so that I never give people may Gmail address directly. This keeps me from being locked into Gmail, since it would be trivial to redirect the forwarding to some other email service. It's also an easy setting to send mail from my Gmail account with the "from" address showing my domain name. The only other wrinkle is that when I send email from my Gmail account I also BCC my Yahoo account, to maintain a redundant copy of my Sent mail. Art Hunter - "At least twice a year I make and save a copy of my outlook.pst file separate from the monthly Windows 7 backup. This is easy and fast." I save my complete Outlook folder in isolated locations, including a portable drive which allows me to update another computer when I travel between homes. I backup Gmail with MailStore Home, a free version that seems to backup all folders and only the new emails when updated. They are accessible with the program itself, if you want to search for particular emails. After Gmail's most recent outage, I chose this as a reasonable option, not having an email client, as mentioned in your article. I guess I'm missing something here. What good does "back-up" do if you can't restore? 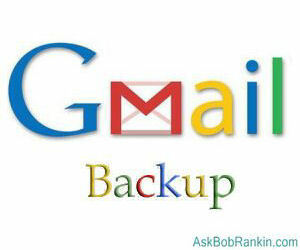 Regarding on-line Gmail backups, you suggest as first steps, "Create an email account [with another 'cloud' service]. ... [Then] Log in to Gmail and click on 'Create a filter' at the top of the page. In the 'From' field, enter your Gmail address to select all messages that you have sent." I tried entering "*. *" (the old DOS command for "anything and everything" in the "From" field of the Create Filter command, and it seems to have selected EVERYTHING. By that I mean, it selected mail I have sent from various addresses within Gmail, PLUS mail sent to me by anyone. Doesn't this do a more thorough job, and save a step or two, versus creating filters for each outgoing e-mail account AND a filter for each incoming e-mail address. Apparently, using a filter to select mail and then forward it to another account only works from this point forward. Gmail displays this note when setting up the filter: "Note: old mail will not be forwarded." This note appears even if I check the box next to "Also apply this filter to all XXXX conversations below". So, it appears that this method will NOT back up messages I have already sent or received. That's too bad. "If your inbox suddenly and abnormally skyrockets in size, you might get an email message from Windows Live Hotmail asking you to slow down, move email from Hotmail to your desktop, or delete some old email. Please read these messages and follow the advice provided in them to continue to enjoy ever-growing storage. "If your inbox grows too fast, you might not be able to receive any more messages." Sharing my view as being a developer.There are many email backup client available today. One of them is Beyond Inbox, which proving more than backup. Using Beyond Inbox, you can backup, restore, archive, transfer or organize email from any IMAP enabled email account. Download Gmail backup tool from http://www.gmailbackup.org/ and which is the best & easiest method to backup Gmail data including email, contacts, calender & documents to a local machine.